Liquid biopsies use whole blood to assess biomarkers typically only accessible through invasive tumor biopsies. Whole blood draws are less invasive, less painful for the patient, and more economical than obtaining a tissue biopsy. To learn more about how we can help you utilize liquid biopsy samples in your biomarker development strategy. 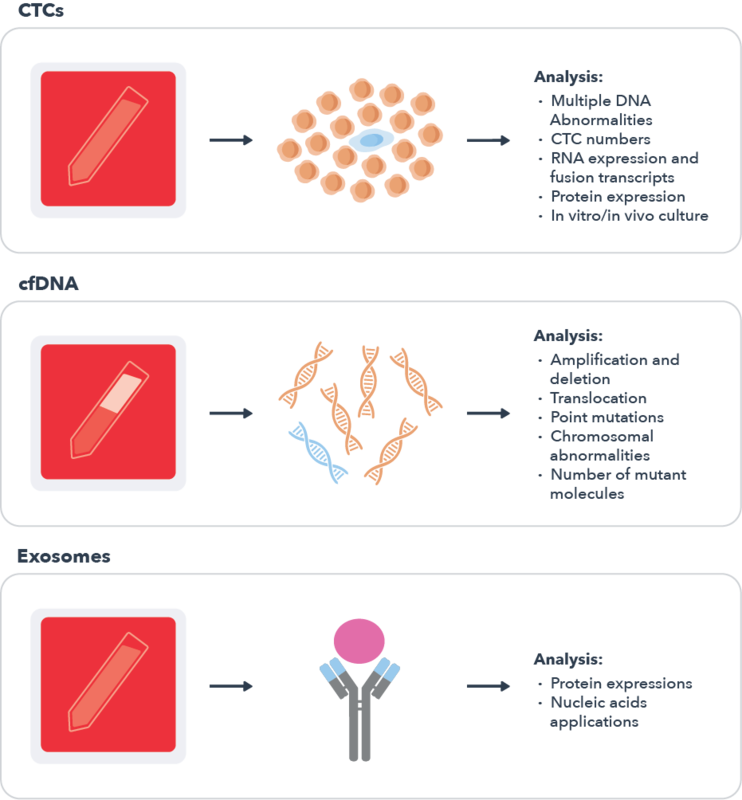 Liquid biopsy biomarkers can be detected using various sources of biological material including circulating tumor cells (CTCs), cell free circulating tumor DNA (ctDNA), and exosomes. The ability to monitor different biomarker endpoints in liquid biopsies requires the integration of various platform technologies. Analysis of liquid biopsies can generate different types of useful biological information that can be complementary in assessing the mechanism of action of investigational therapies, maximizing efficacy in patients, stratification for patient enrollment, and identification of resistance biomarkers. Precision for Medicine (formerly ApoCell) offers a comprehensive approach to using liquid biopsies to detect multiple biomarkers using less sample for CTC isolation technology, ctDNA and exosomes. Precision for Medicine specializes in the use of liquid biopsies for capturing rare cells including CTCs, circulating endothelial cells (CECs), cancer stem cells (CSCs) and other targeted cell types. This removes the necessity of obtaining tumor biopsies from patients to monitor the pharmacodynamic effects of investigational therapies in clinical trials. Our platform agnostic approach in capturing and interrogating rare cells from whole blood has enabled us to better understand the challenges associated with the detection and optimization of biomarkers in CTCs. In addition to our proprietary ApoStream platform for CTC capture, we use many cutting-edge technologies including immunomagnetic based capture for sensitive, targeted enrichment of different CTC subtypes for further downstream characterization. Along with our collaborators, we have advanced the scientific knowledge of CTC biology enabling the detection of different CTC phenotypes based on the type of cancer being detected and independent of the treatment status of each patient. Our approach ensures an adequate number of CTCs are available at any given time point to monitor the pharmacodynamic effects of investigational agents. Our integrated platform technology approach to the isolation of CTCs, exosomes and ctDNA enables us to detect and measure various types of genomic biomarkers. We specialize in handling low levels of genomic material and drive sensitivity to detect various endpoints from ctDNA or exosomes, to single cell transcriptomics in rare cells. We understand the challenges of needing to generate large amounts of high quality biomarker data with limited tissue and sample availability. We offer a comprehensive liquid biopsy service offering using our integrated platform technology approach for capturing and enumerating CTCs with ApoStream to using sensitive genomic applications for detecting ctDNA and exosomes all from the same sample. Precision for Medicine can create the ideal workflow for you to maximize your biomarker data while minimizing your sample acquisition costs and the need to ship samples to multiple laboratories. Precision for Medicine is pioneering the use of liquid biopsies to develop biomarker assays by combining ApoStream, protein biomarkers, ctDNA and exosomes. The quality of the data generated from liquid biopsies starts with patient sample collection. As part of our suite of clinical trial services, we specialize in manufacturing and distributing validated, temperature-controlled sample collection kits to maximize the stability of liquid biopsies during transit. Once the kits are received at Precision for Medicine, all samples are processed in real-time, 7 days a week, 365 days per year to ensure stability, reliability and consistency across various collection sites. Precision for Medicine is a pioneer in capturing and analyzing circulating tumor cells (CTCs) from patient blood to monitor the pharmacodynamic effects of investigational therapies in clinical trials.